One of our dedicated readers. Sgt. Travis Beard sent me an email asking if I would post a question for the masses to answer. I saw sell it and get yourself a nice bike. Losing that significant other could either be good or bad. It all depends on how you look at it. Either way you have no need for a tandem bike. I would take RL’s advice and get rid of it. One less thing you have to remind you of the other person. Well i didnt actaually lose anyone.. I picked mine up at a swap meet here in stuttgart. I was just wondering that because i always see men and women riding tandems, and they are usually married or dating. yes i ponder some strange things when i am bored at work. Travis, how do you like Germany. I’ve actually considered my next PCS to Europe. I love it. I its kinda strange though. I am at a Army base.. being air force its kinda strange. But I love Europe. but my wallet doesnt . With inflation here in Europe going crazy… And the weak dollar, the 1st and 15th do not come soon enough. I take the bike for the economics of it. I’ve never ridden on a tandem. Do people use them for anything other than romantic liesurely rides? They seem like a novelty to me. They had a Tandem race the other day about 30km from here last weekend. I saw this dude at the Rosarito-Ensendada ride riding a tandem with a fake skeleton riding on the front. There’s an idea for you. Whenever I see a couple riding a tandem, I wonder why it is that the guy is always up front. Maybe it’s just me, but I would prefer to be on the rear. I mean the back part of the bike. Errr, no I don’t. Sorry. To me, the day you sit in the back of the tandem is the day your mancard expired. It would be the same as you taking your wife’s last name after getting married. The man has some amazing bikes. The last time I saw him, he was on a bike he’d switched to a left-hand drive. “Just because.” Come to think of it, I’m not sure I’ve ever seen him on the same bike twice. I’ve never been to his house, but I’m positive he lives in a tent out in the back yard because the house is full of bikes. Now I see. 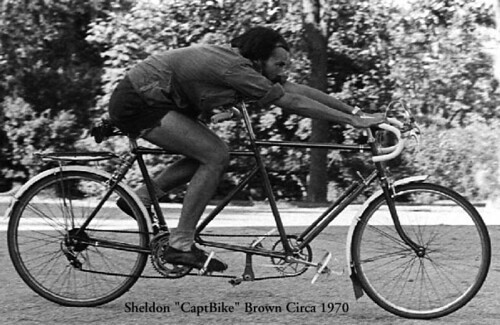 The tandem bicycle is more than a novelty; it’s a symbol of patriarchal oppression. Man card? I never got no stinking man card. And what’s wrong with taking your wife’s name? Why should she have the sole right to take a man’s name, trash the hell out of it, file for divorce and then switch back to her original and untrashed name. Seems like a good deal to me. Add to that the “her money is my money and my money is my money” option and I’ll sign up right now. Hey, I could even have my very own show towels. AHHHH look what a single question can start.